Bring your dog on the train! Passengers would be allowed to take their pet cats or dogs on certain Amtrak trains under a bill introduced yesterday in Congress. The measure drew praise from The Humane Society of the United States and its lobbying affiliate, the Humane Society Legislative Fund. U.S. Reps. Jeff Denham, R-Calif., and Steve Cohen, D-Tenn., introduced the legislation. 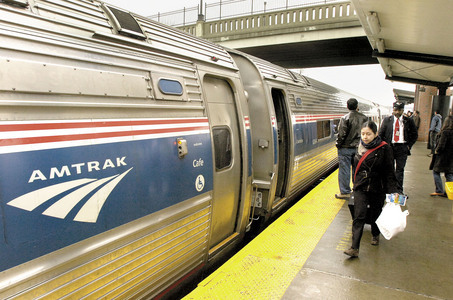 In our opinion, this is a great way for Amtrak to further distinguish itself from air travel and is another of many reasons why so many people will want to take trains. Amtrak currently does not accept animals unless they are assistance dogs. Passengers traveling on Amtrak must either leave their pets at home or seek alternate transportation. This can result in additional hardship and expense on behalf of the owner if Amtrak, the national rail operator, with more than 500 destinations, is their only option for transportation to a particular area. Read more about rail travel on GoNOMAD Travel.